A plaque in Aberdeen honouring Aung San Suu Kyi, the leader of Myanmar, is to be removed. The plaque was erected in Hazlehead Park alongside a jasmine plant at the request of Amnesty International 10 years ago. 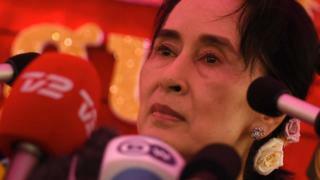 The council motion to remove it came amid accusations she has ignored violence against the Rohingya Muslims in Myanmar. Councillors have now agreed to remove it. The cost of replacing it with a new plaque dedicated to all the people of Myanmar will now be assessed. The motion was from Lord Provost Barney Crockett. He said: "I think it's really appropriate we replace it with something calling for human rights." The 73-year-old leader of Myanmar - formerly Burma - was awarded the Nobel peace prize in 1991 while under house arrest in Rangoon. She was hailed as a beacon of democracy. After elections in 2015 she became Myanmar State Counsellor, the de facto head of the country's civilian administration. Two years later violence erupted in Rakhine province after Rohingya militants attacked police posts, killing 12 members of the security forces. In response, Myanmar's army has been accused of killing Rohingya civilians and burning their villages, forcing hundreds of thousands to flee to Bangladesh. Ms Suu Kyi has faced international pressure to condemn the army's alleged brutality towards the Rohingya, a Muslim minority which is stateless in majority-Buddhist Myanmar. Last month, she had her Freedom of Edinburgh award revoked. Other cities - including Glasgow, Newcastle and Oxford - have also acted to strip her of similar honours.